Acknowledged as a design genius, Max Bill (22 December 1908 – 9 December 1994) was a Swiss architect, artist, sculptor, painter, typographer, industrial and graphic designer. A pupil of Bauhaus founder Walter Gropius, he was famed for the clarity and proportions of his designs. Prolific, he left behind a huge portfolio of work, amongst which was a long term watch collaboration with Junghans. The collaboration with Junghans began in 1956 when they commissioned him to design a kitchen clock. Director of the Ulm School of Design at the time, he came up with the now famous design of the Max Bill Wall Clock with its distinctive numerals. It now forms part of many international design collections, including at the Victoria & Albert Museum. This first design provided the inspiration for the series of watches that Bill would design for Junghans from 1961. Max Bill viewed the creation of objects as the ‘design of an environment’, valuing the principle of form following function, design based on intended purpose. The minimalist lines of his clock and watch designs illustrate this. There is nothing unnecessary, no additional flourishes. In recent times, Junghans reintroduced his watch designs, and this Max Bill watch is true to the form of the original, with little altered apart from the use of more modern materials and an updated movement, the automatic J800.1 with 28,000 VPH and Incabloc shock absorber. As a part of Junghans’ reinterpretation of Max Bill’s designs they have also brought in new designs and versions such as the Chronoscope, but I prefer the unadulterated form of the original. They say that good design proves itself with time. In looking at this watch, it is clear that it is one beautifully designed timepiece, and that its design is still fresh. Thin curved hands matched with the thin hour and minute markers, a domed plexiglass crystal, this watch is pure design class. With a case size of 38mm and a thickness of 10mm, it’s a slim piece that sits so comfortably on your wrist that you barely notice its presence. If watch movements matter then yes they are nothing special, so you may remain unconvinced about them, but this watch is all about the design. This may well be one of the most beautifully designed (and reasonably priced) watches you’ll ever see that somehow still manages to stay below the radar. 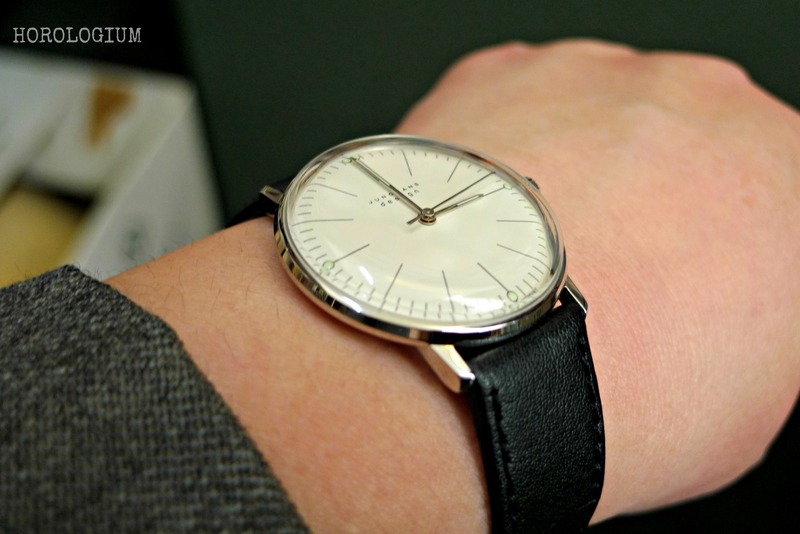 There is a case to be heard for Max Bill’s Junghans watches being the best exemplars of Bauhaus styled watches. 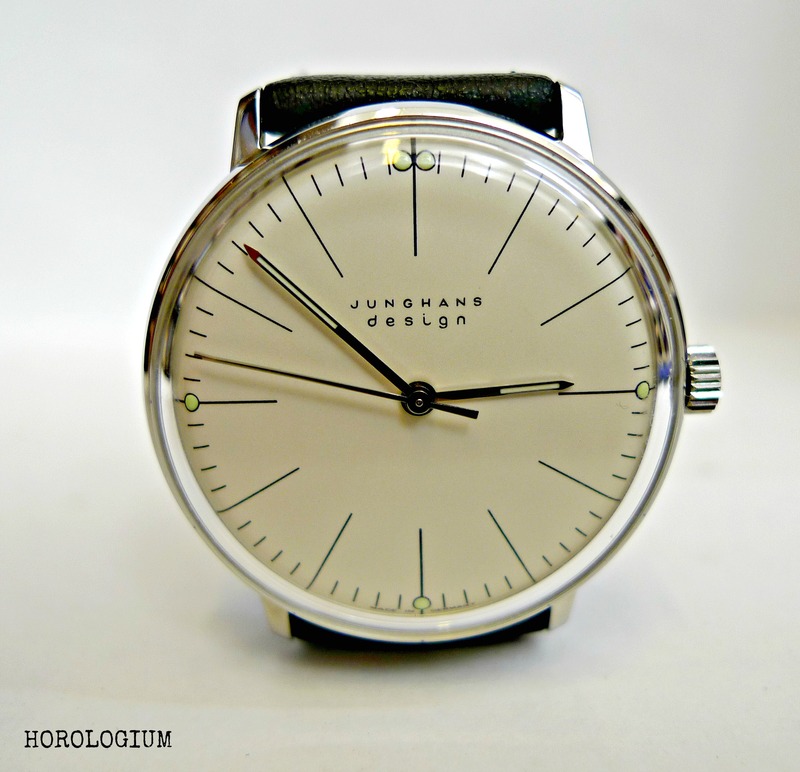 The Junghans brand is not widely known nowadays amongst the general populace, and the Max Bill models even less so. Happily, they are easy to find online, but there are a number of different retailers, so it’s best to shop around. ‹ Would you like a side of moon to go with your Speedy? I’ve absolutely loved those since first seeing them. Very glad to see it’s now 38mm. Didn’t they used to be 35-36mm? Yes I believe so. There are about half a dozen that are 38mm now, I think. A much better size, I reckon. Smaller ones are still available. My Dad has one of the remakes. Beautiful, elegant watch. I’ve owned a Max Bill 027/3700, just the same as the one in the pic. Although I’m in favour of bigger sizes, I think the 34mm respects the original conception and is therefore close to the Max Bill “gestalt” concept. It’s a timeless piece, pure combination of space and lines. Therefore it can be “formal” as well as “casual”: it’s beyond contexts, trends, and conventions. It’s just unique. I own Rolex, Patek, Vacheron. But, when it comes to mere design, I think this is “the watch”. My 5 cents for the topic. Agree that it’s timeless and for both ‘formal’ and ‘casual’. The more I look at it, the more I like it. It’s a difficult thing, to find ‘the watch’, so if you have found one, you are fortunate indeed. Many are still searching.